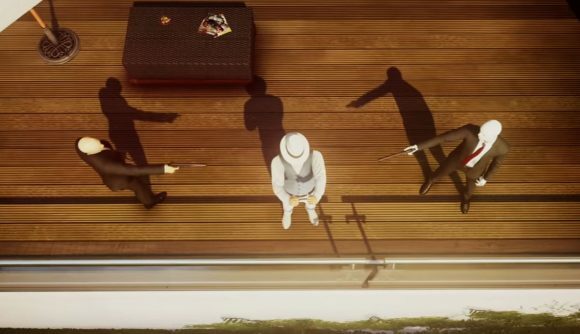 Hitman developer Io Interactive has announced a new competitive multiplayer mode ahead of the release of Hitman 2 next month. Ghost Mode is a 1v1 game mode in which two players race against one another, in an ultimate test of both speed and stealth. Of course, no other assassin can compete with Agent 47’s abilities when it comes to taking down his targets, so the only way to keep the competition fair is to make the world’s deadliest assassin compete against himself. Two players will start each round of Ghost Mode alongside one another, with their opponent visible as a ghost. You’ll be able to track their movements, but nothing that happens in your game will impact them, and vice-versa. The aim of the game is to take out the same target as your opponent, but to do so faster and cleaner than they can manage. Ghost mode will play out in a best-of-nine format, meaning the first version of Agent 47 to win five races to their targets will be declared victorious. Each round will start out with a different, randomly-selected target, but each ghost will begin with no equipment. You’ll have to work your way around each level to find the right gear to take your mark out. But spend too long searching, and your opponent could claim an advantage. Check out our preview of Hitman 2’s new multiplayer mode here. Ghost Mode will be available for the game’s Miami map from the Hitman 2 release date on November 13, and will head to other locations from both Hitman and Hitman 2 post-launch. For a closer look at Ghost Mode ahead of the game’s full release, check out the trailer in the video above.